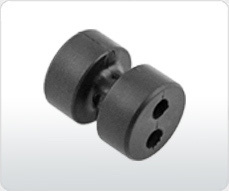 Developing an under-the-hood transmission component that requires tight tolerances and provides resistance to heat, oil, and other automotive fluids and chemicals; an Automotive OEM customer partnered with Woodland Plastics to mold this retaining plug out of a thermoset phenolic material – SBNA RX 655. This transmission component is injection molded in a 4-cavity tool from a 50-ton thermoset injection molding machine. The molded part is deflashed in an automatic wheelabrator, post baked in an oven to de-gas the parts, inspected, and then degated in our automatic degating machine before being centerless ground, washed, dried, inspected, and finally shipped to customer plants around the midwest. Final part weighs roughly 2.9 grams with a tolerance of (+/-) .0004 per inch. Product Description Transmission Retaining Plug used within an automotive transmission application.